Rolling Stop Pedestrian Accidents In California: Is It Illegal To Roll Through An Intersection When Making A Right Turn? On behalf of Admin of JML Law, A Professional Law Corporation posted in Pedestrian Accident on Monday, Nov 05 2018. You do not necessarily have to be jaywalking or crossing the road or intersection at unmarked crosswalks to get hit by a car in California. Have you heard about rolling stop pedestrian accidents, which are responsible for hundreds of fatalities in California alone? Our Los Angeles pedestrian accident attorney at JML Law explains that a rolling stop, also known as “the California stop,” is rolling through an intersection without coming to a complete stop at a stop light or red light. Rolling stops are most common when a driver is attempting to make a right turn at an intersection. Are rolling stops legal or illegal in California? Rolling stops put the lives of pedestrians crossing an intersection at risk, as these pedestrians often do not expect anything bad to happen to them when crossing legally at an intersection and rely on the drivers to practice safe driving and stop properly. Unfortunately, not all drivers in California practice safe driving or follow the state’s traffic laws. Our experienced pedestrian accident attorney in Los Angeles explains that rolling stops are illegal in California. Contrary to the popular belief, rolling through an intersection instead of coming to a complete stop at a stop or red light is prohibited by law. Fact: Statistics show that each year, of more than 700 people killed in pedestrian accidents in California, the vast majority of fatalities occur when a vehicle is turning right on a red light. Thousands of other pedestrians sustain injuries in rolling stop pedestrian accidents, though this figure is most likely higher given that such accidents are hugely underreported in California. Is it illegal to roll through an intersection when making a right turn in California? Under California law, all motorists must come to a complete stop at a stop or red light before making a right-hand turn. In fact, vehicles in California are legally required to give pedestrians the right-of-way when crossing these intersections before making the right-hand turn. That’s where most drivers in California are mistaken by the wording. They think that a rolling stop counts as a “complete stop,” which is not true. Our Los Angeles pedestrian accident attorney cannot stress enough that rolling stops are prohibited by California law. 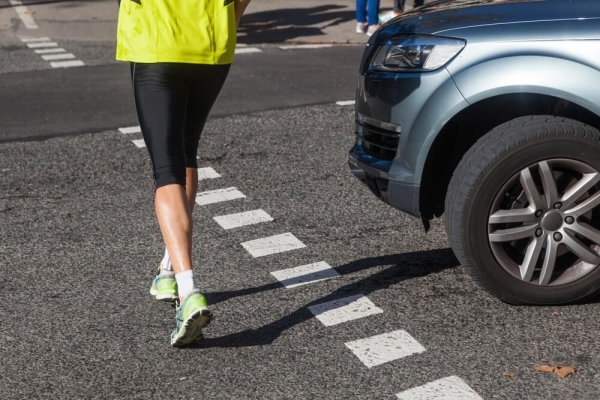 What to do if you have been injured in a rolling stop pedestrian accident? When you are crossing an intersection in Los Angeles or elsewhere in California, chances are you are minding your own business, listening to some podcast on your iPhone, typing some hilarious tweet, applying filters to your Instagram photo, or doing anything but paying attention to the cars around you. After all, you expect drivers to do what they are legally required to do at a stop and red lights. But there is a risk that a car will appear out of nowhere and hit you when you expect it the least. If this happened to you, chances are you have been struck by a driver who decided to carelessly roll through an intersection or make a right turn without coming to a complete stop. Or, even worse, the driver was simply distracted by his or her phone or any other device and ran a red light at high speed. Either way, the driver failed to exercise due care and violated California’s traffic rules. Make sure you are represented by a Los Angeles pedestrian accident attorney in order to recover damages for your injury sustained in a rolling stop accident. Get a free consultation about your case by contacting JML Law. Call at 818-610-8800 today.